In 1924, one spring morning, when I was Superior of the house in Żytnia Street, I was told by a person working at our gate that a young girl had come to ask to be admitted to the Congregation. So I went down to the parlour and opened the door slightly, however, at first glance, the candidate, who was sitting in such a way that she did not see me, did not make a good impression on me because her appearance was a bit shabby. I thought: well, she is not for us! I closed the door quietly with the intention of sending in another sister to tell the candidate that her request had been turned down. However, at that moment it came to me that it would be more in accordance with the love of neighbour to ask the girl a few general questions and only then to say goodbye. Therefore, I returned to the parlour and started talking with her. Then I noticed that on further acquaintance the candidate made a much better impression, that her smile and facial expression were nice, that there was a lot of simplicity and honesty about her and that what she said was very sensible. Therefore, I soon changed my mind and I started to feel like admitting her. The main difficulty was that Helenka Kowalska was poor, not to mention the lack of a dowry, from which the Holy See easily dispensed sisters. She did not have any trousseau and we did not have any fund for it either. However, I suggested that she could go to work as a housekeeper and save a few hundred zlotys for the trousseau. She was very eager to do that and we agreed that she would bring the money to the gate in order to give it in for safekeeping. It was decided that she would do that. Soon after I said goodbye to her and forgot about it. Therefore, I was astonished when a few months later when I was living in Vilnius, I received a letter in which it was written that a person had brought 60 zlotys for safekeeping and that she said that she had been told to do so. Only after a moment’s thought did I realize what was going on. Since that time the deposit grew steadily, so after one year a few hundred zlotys was saved, which at that time was enough for a Modest trousseau for a nun. During that year Helenka worked as a housekeeper at a lady’s home (…), who was extremely pleased with her. She visited her when Helenka had already entered the postulancy and she told the sisters that she had not worried about her children when she left them in the care of such a reliable and trustworthy person. She could not also accept the fact that Helenka would enter the congregation. Once she even tried to talk her out of her vocation – we know it because Sister Faustina told us about this. Soon after entering [the Congregation of Sisters of Our Lady of Mercy Helenka Kowalska] was sent to Skolimów, where in 1925 we rented a detached house. It was a summer house for our sisters and wards from Warsaw. In the autumn only one sister remained there – a convalescent. She was with a companion and Helenka cooked for them, she carried out this duty perfectly. Having entered the Congregation Sister Faustina was entrusted to Mother Jane’s care, one of our oldest and outstanding Mothers. At that time, in 1925, she took care of the postulants. Mother Jane grew fond of the young sister, she evaluated her attributes and came to know her spirit of prayer, because, only a few months later she told me: ‚Helenka is a soul that is very closely united with the Lord Jesus’. I was delighted to hear that but I did not ask her about the details. Only when Sister Faustina was in the novitiate in ‚Józefów’ did she tell me herself that once, when she had been in the house in Żytnia Street, in her room she had a vision of the Lord Jesus, who helped her to overcome a temptation against her vocation. It seems that she also mentioned this in her notes. Since then many times she told me about her mystical experiences, about the words which she heard interiorly. Once, when she was a young professed sister in Warsaw, she even gave me her notes about her interior lights, which she had written down with a pencil. However, I must admit that I did not attach much significance to this and I only looked through the notes. I have an impression that she included some of them in the diary which she wrote at the request of her spiritual director. She made her first vows on the 30th April, 1928. Soon after she went to Warsaw, where she cooked in the wards’ kitchen. The girls who worked with her there held her in high esteem, which was especially visible when after her death they came to know about the spreading devotion to the Divine Mercy. They had fond recollections of her and they thought that they were happy to have worked with her. Anyway, in the other houses wards said the same. At work the sister told them about things that were inspiring and she encouraged them to make small sacrifices for God. The circumstances were such that it was necessary to transfer Sister Faustina to various places frequently, so she worked almost in all the houses of the Congregation and after the short stay in Warsaw [in Żytnia Street] and in the Grochów district she was moved again – to Płock. From that place, for a short period of time, she was transferred to Biała, an agricultural colony of the Płock house. However, her main job in Płock consisted in working in a shop – she sold baked goods from a local bakery until her third probation (at the end of 1932). She devoted herself to that and carried out the new duty very diligently so even today – maybe more so than at that time – I appreciate how enthusiastically the soul that had such an interior life did such a mundane task. 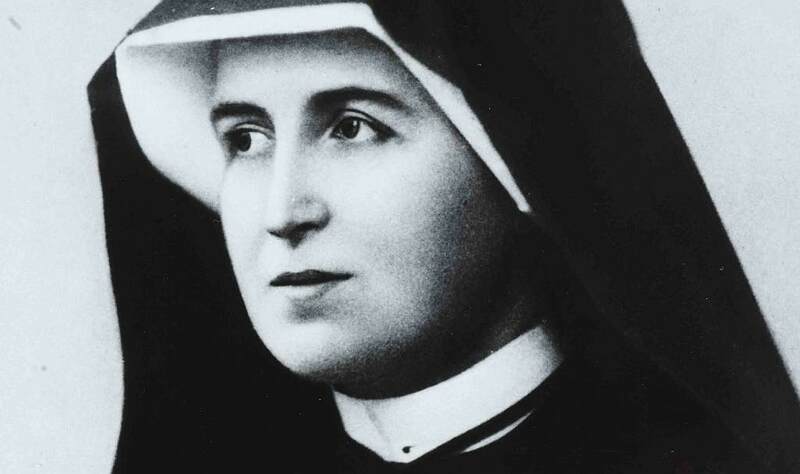 Approximately one year before the third probation something happened and because of that, although I treated her with a lot of kindness, involuntarily I must have made her suffer – at that time, the then Mother Superior from Płock let me know that during a vision Sister Faustina had received an order – to paint the image of the Divine Mercy. As long as her profound inner and mystical experiences did not go beyond the monastic walls, and remained a mystery between God, her soul and the superiors I was happy considering all the graces a great gift which God had bestowed on the Congregation. However, it was not the case when the Sister’s revelations started to seek to be known externally. Then I was really afraid not to introduce even a smallest new thing, false devotions etc. to the life of the Church and, because I was general superior, I felt that I was responsible for our Congregation as regards this matter. I was also afraid that it was due to Sister Faustina’s wild imagination or hysteria because what she had forecast did not always come to pass (…). So, while I was eager to listen when with simplicity and sincerity she told me about her profound and beautiful thoughts and supernatural lights and I felt heartened by them, when she asked me for permission to do something, I treated them with a great reserve and many a time I sought advice from a theologian. The superior from Płock told me that the sister was to paint a picture but Sister Faustina herself turned to me only after she came to Warsaw for the third probation. I replied: ‚Good, Sister, I will give you paints and canvas. Paint, Sister’. Distressed, she walked away and – as far as I know – she asked a few sisters if they could paint an image of the Lord Jesus for her. She did it discreetly but to no avail because the sisters could not paint either. However, it was visible how much she was stirred by this thought. As far as I know today, the preparation time for the last vows was rather difficult for Sister Faustina. She was concerned about painting the image. Moreover, her health started to deteriorate and she had to go to a doctor who, at that time, stated that there was nothing wrong with her. Today I think that the diagnosis was incorrect. And finally, Mother Jane, who understood her so well at the beginning of her religious life, having heard about a revelation, reprimanded her severely a few times – she forbade Sister Faustina to get into extraordinary things because they could lead her astray etc. Sister Faustina was tremendously sensitive, also to these reprimands. Because of all of that Sister Faustina, engrossed in what was happening in her soul, helped the sister working in the vestiary, who she was assigned to aid, less zealously than usual (which was a mortification of the sister working in the vestiary). However, outwardly everything went properly and normally, so having had a retreat, Sister Faustina made her perpetual vows in ‚Józefów’ on the date that had been set – the 30th April [1st May] 1933. At that time Mother Margaret Gimbut was Directress of the Third Probation; the sisters made the probation in Warsaw. Knowing this soul [Sister Faustina], I understood it well that she should be under guidance of someone who was experienced and that is why I wanted her to stay in ‚Józefów’ after the vows so that she benefited from the spiritual direction of Father Andrasz, whom she trusted a lot. However, strangely enough, events began to take a different course. God, in His Providence, wanted Father Andrasz to help her during the last moments of her life. All the young professed sisters had already started carrying out the duties they have been assigned to and Sister Faustina was still waiting. Meanwhile I received a letter from the house in Vilnius with an earnest appeal for a sister who would work in the garden. At that moment Sister Faustina was the only suitable candidate for this post, so having hesitated for a few days, I called her and told her about this, adding: ‚Sister, you know how much I have wanted you to stay here, but it is impossible’. She simply replied that she would go most willingly and that she trusted she would find a spiritual director there. Indeed, she found the Rev. Professor Sopoćko, who developed the devotion to Divine Mercy a lot. Rev. Professor Sopoćko, the then confessor to the sisters in Vilnius, became interested in Sister Faustina and made a request for sending her to a doctor in order to have her nervous system and mental state examined and when the result of the visit was in her favour, he talked with the then Superior of the house, Mother Irene, about painting the image. I was delighted to see that this case was in a priest’s hands. As it is known, the painter Kazimirowski made the image according to Sister Faustina’s instructions. I have come to the conclusion that the artist also made smaller sketches – Sister Faustina brought me such a one to Warsaw when in 1936 she came back from Vilnius and when she asked me to hang it in our little internal chapel or in a room of the Congregation, adding that the Lord Jesus had requested that. However, I explained to her that such an original image would astonish the sisters and that it was difficult to tell everybody about its origin. So I put the sketch to the archive, where it burnt down along with the whole house during the uprising. I did something similar with the Chaplet to Divine Mercy. When the Sister confided to me that the Lord Jesus had taught her a new chaplet, I listened to her attentively and I did not reply or maybe I said something neutral – I do not remember. After that she came to me suggesting again that she would write this chaplet for me. I still have the slip of paper. However, I did not agree to say it together, explaining that we already said a chaplet to Divine Mercy during the evening prayers and that it was even possible to gain indulgences thanks to it. She replied to me: ‚But this one is different’ – and we did not speak about it any more. Once, in Vilnius, [Sister Faustina] turned to me saying that the Lord Jesus requested that a congregation completely devoted to Divine Mercy worship be founded. It was supposed to be an enclosed one. Although she did not say it, I could sense that she thought that she was called to lead this congregation. In my opinion this project showed faintly somewhere in the distant future and I said that I doubted if the thought came from God totally and if the Sister understood the inspiration well. (As an example of such a misunderstanding I told her about Saint Francis of Assisi, who having heard the words: ‚Repair My Church’ got down to rebuilding St. Damian’s church.) I told her that it was necessary to pray, ponder and wait. For some time the Sister did not tell me about this, however, it did not last long. She was preoccupied with it and she returned to the subject as soon as it was possible. I took a firmer stand on the repeated demands, especially because it was also about the Sister’s leaving the Congregation. Therefore, I told her that being superior general I was responsible for the sisters’ vocation and that was why I could not assent to her plans without giving them a lot of thought and without making sure that this was God’s will and not a temptation from Satan. I said that perhaps it was the evil spirit who wanted her to drag her along to the world and then she would not be Sister Faustina any more but Helenka Kowalska again. Then I said: Sister, you have the special inspiration, but now I do not, so please pray so that God gives me a light, an internal or external sign. Then she suffered a lot. It was apparent that the thought of leaving our Congregation, which she loved a lot (she wanted her younger sister to join us) caused her a lot of anxiety. On the other hand, it seemed to her that she should carry out God’s will, so the couple of years may have been the most difficult period of her life. It happened that then she was sad, depressed, but she was always where she was supposed to be and carried out her duties. I wanted her to recover her mental equilibrium and I also wanted to end the situation so, having consulted the advisers, I transferred her from Vilnius to Cracow in the spring of 1936. On her way, she stayed at Walendów for a few weeks, then at Derdy, where she was needed for various reasons. Then it struck me that in both houses the sisters were under her spell; they wanted her to stay with them and they were inspired by her behaviour. In ‚Józefów’ Sister Faustina was assigned to working in the garden, but her interior dispositions did not change. She was beset with doubts all the time: should she stay in the Congregation or found a new one. She always corresponded with Rev. Sopoćko, who also visited her and conversed with her about the matters of the soul, however, it was only from time to time, because where she stayed, in ‚Józefów’, she sought Fr. Andrasz’s advice. After some time she had symptoms of a lung disease, so in autumn she was sent to Prądnik Hospital. Following the doctor’s advice, she spent the winter there and the state of her health improved so much that she was allowed to go back home. Again, she worked in the garden. She told me that she expected to see a person who the Rev. Professor Sopoćko deemed suitable for the new congregation and who was to come to Łagiewniki. She received permission to do so, however, the meeting did not take place. When in 1937 I was going to the house in Cracow to carry out a visitation, during a meeting of the council I asked the general councillors if it was not suitable to allow Sister Faustina to leave the Congregation if she still experienced the unrest. They consented to this. It made us sad to loose this good and zealous Sister, but we feared to do something against God’s will. When I saw her, in my opinion Sister [Faustina] was calm, however, when she came to converse with me, she repeated her request immediately. In accordance with what I had agreed on with the sisters, without thinking, I replied that I gave my consent. I saw that she was surprised. She asked if I would do the necessary formalities. I replied that I would not know how to justify her desire to leave the Congregation because of the revelations and then she asked if she could go to Fr Andrasz, who, however, as it turned out, was not present there at the moment. Of course, I allowed her to do so and we parted company. On the very same day in the afternoon I went to our house in Rabka for a few days and having come back I watched with interest how Sister Faustina behaved. I was surprised to see that she was carrying out her daily duties as if nothing had happened, so I waited a bit and then I called her and asked about the matter. The Sister replied with sincerity and simplicity that the moment I gave her a free hand, in her soul, she felt as if she were in a dark precipice, completely alone and abandoned, unable to take any step, and the thought about leaving the Congregation went away. We talked about the subject affectionately and since that time we did not mention that. Now it seems to me that I can regard the sudden darkness in her soul as God’s sign which we waited for. In the autumn of 1937 Sister Faustina’s health began to deteriorate again – she was transferred from the garden to the gate, where she was very kind, nice and good to the poor. When the disease was developing it was necessary to isolate her from the others, along with Sister Fabiola – who also had a lung condition. God permitted it to happen that since the time when Sister Faustina was in Vilnius the then Infirmarian had not quite believed that her experiences, which she knew a bit about, were true and the sister who took care of the sick was really afraid of getting infected with tuberculosis. Because of that, as I came to know about it later, the care of the sick frequently left much to be desired. However, Sister Faustina did not complain about this. Only when in spring did I come from Warsaw she mentioned that to me adding that she was saying it in order to prevent something similar from happening in the future. The next Sister Infirmarian surrounded her with really loving care. In 1938 during the Easter time, [Sister Faustina] was sent to Prądnik again because her health had improved when she stayed there before. In the sanatorium, as during her first stay, she also made the best, a really inspiring impression on the sick, the nurses and the doctors. It was also there that I saw her for the last time. In July I was in ‚Józefów’ and, having heard that her disease was developing I went there to visit her. I remember our last meeting as the nicest one. The Sister was delighted. She told me with animation about various episodes of her life in hospital and the only one hour that I had at my disposal between my arrival and departure by coach passed very quickly. We did not touch upon her interior matters especially, only – soon before we parted company – she said joyfully: ‚Oh, dear Mother, how beautiful things the Lord Jesus tells me’, and, pointing to where her notes lay, she added: ‚Dear Mother, you will read all of this’. In my opinion she was weak, however, she did not appear to be a person who was seriously ill – she went to the chapel and the common place where the sick lay in the sun. In August in Warsaw I was informed that her state was deteriorating, therefore, I wrote her a secret note in order to prove that I sympathized with her and remembered her. I also mentioned that Rev. Sopoćko would take part in the synod in Częstochowa and that he would probably visit her then. The few words must have pleased her a lot because after her death the secret note was found in a casket where the notes and letters from the spiritual directors were. She replied to me by sending a beautiful letter, which I quote in here. There is no date in it, but it was written at the end of August, 1938. Thank you most kindly for your secret note, it was lovely. I am also grateful for the news about the Reverend Father Sopoćko; he is truly a holy priest. Dearest Mother, it seems to me that this is our last conversation on earth. I feel very weak and I am writing with a trembling hand. I suffer as much as I am able to bear. Jesus does not give us [anything] beyond our strength. If the suffering is great, then divine grace is likewise powerful. I completely abandon myself to God and His holy will. An ever greater longing for God pervades me. Death does not frighten me; my soul abounds in deep peace. I still complete all the spiritual exercises. I also get up for Holy Mass, but I do not stay till the end because I feel faint; nevertheless, as much as I can, I do take advantage of the graces which Jesus has left to us in the Church. Dearest Mother, from my heart filled with gratitude, I thank you for all the good things I have experienced in the Congregation since the very moment of entrance until now. Dear Mother, I thank you particularly for your sincere compassion and advice in difficult moments, which seemed impossible to endure. May God repay you generously! And now, in the spirit of religious humility, I most humbly apologize to you, dearest Mother, for my shortcomings in observing the rules, for the bad example I gave the sisters, for lack of zeal during my entire religious life, and for any unpleasantness and suffering I may have caused you, dear Mother – even if unintentionally. Your goodness, dear Mother, was [a source of] strength for me in difficult moments. In spirit, I kneel at your feet, dearest Mother, and humbly beg your forgiveness for all the offenses I have committed and ask your blessing for the hour of death. I have trust in the power of your prayers, dear Mother, and of my beloved sisters. I feel that some power is supporting me. I apologize for my poor handwriting, but my hand is trembling and growing weak. Good-bye, dearest Mother, we will see each other in heaven at the foot of God’s throne. And now, may God’s Mercy be praised in us and through us. Six weeks later Sister Faustina died! Three weeks before her death she came back home from Prądnik in order to die among the nuns and on the 5th October the Lord Jesus called her to Himself. Published in: ‚Divine Mercy Newsletter’, nos. 25, 26, 27, 28, 29, 30, 31.